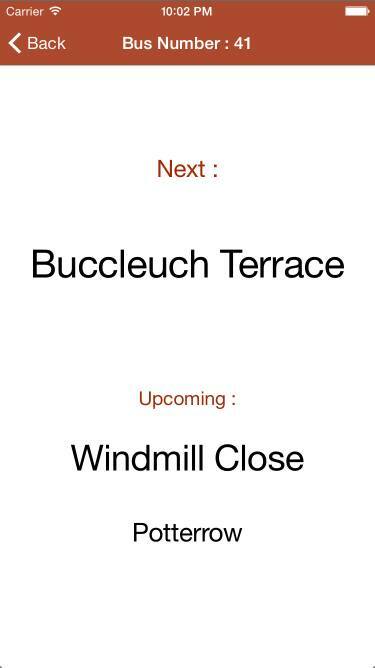 An accessible iOS app to display and read out upcoming bus stops while journeying on Edinburgh buses. Flowery Monsters is a team consisting of a programmer and a graphic designer — two big fans of sci-fi. Driven by the desire to improve the user experience of travel search platform, we redesign a dynamic website for Skyscanner. We tend to mimic flight traveling as an interstellar odyssey so as to arouse people’s desire to travel. We presume the prime target group of Skyscanner would be the young generation as its market strategy is “compare cheap flights, hotels & car hire”, thus we gamify the process of tickets booking and make it more attractive to the youth. In the interface, floating planets with various sizes represent different flight prices, which is more intuitive for users. Theo Pavlakou: Informatics Python, Java, Machine Learning. I’m interested in learning more about web development, both the backend and the frontend. Harri Edwards, Informatics Machine learning and NLP. I’d like to learn about data mining social media. Takes Tweets from the area of Edinburgh to create a map of sentiment around the city. 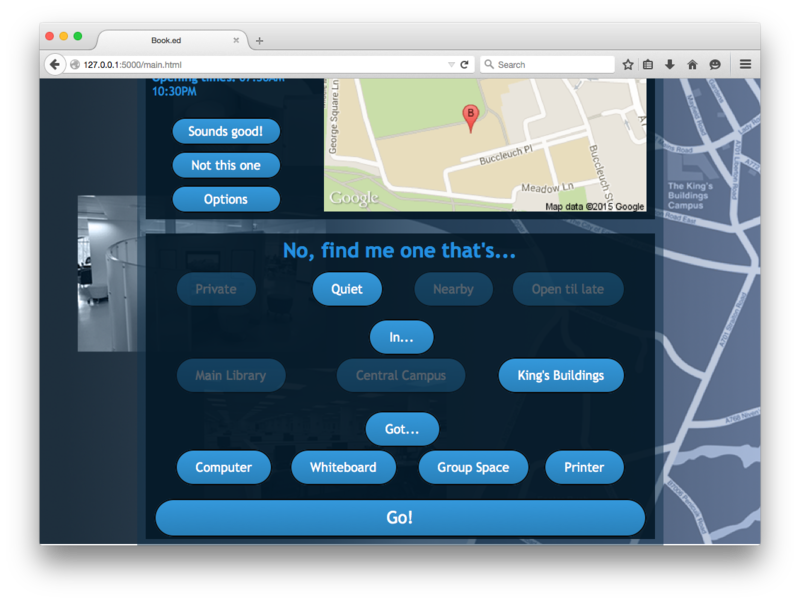 The final product is an interactive web app that provides a clean visualisation of the city’s mood. Users can browse by date, or view the sentiment of live tweets in real time. 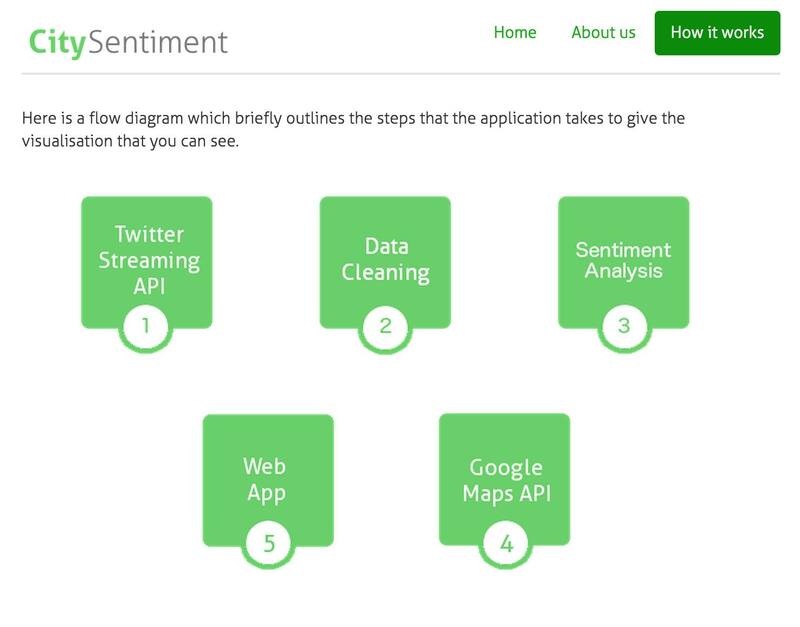 CitySentiment uses sophisticated sentiment analysis techniques to ensure that the data on show is a meaningful snapshot of Edinburgh’s Twitter users. The project could be extended to other cities, and could offer information such as the average sentiment for a user-defined location. Megan Douglas, Social and Political Science: Experience working in the international development field, including Nairobi, Kenya; looking forward to working with students from different disciplines to gain a better understanding of technological innovation within the Global South. Jevgenij Zubovskij, Engineering: Java, HTML, C++, C#, SKills in Electronics. Erin Parsons, Engineering: Knows mechanical engineering, want to learn web stuff. Adam Warren, Informatics: Java, Haskell, wants to learn business strategies. Moise Lubwimi, Informatics: Java, Python, Django, web stuffs, wants to learn business strategies. Collecting and Presenting data from diverse sources on innovative and sustainable technology development in Nairobi, Kenya. 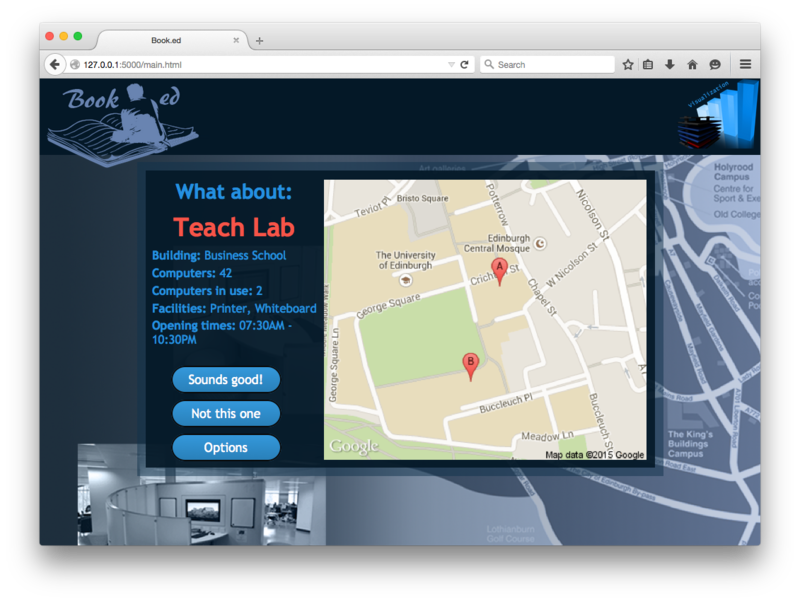 We’re creating a website which will suggest a university study space to users based on location, availabilty, etc. 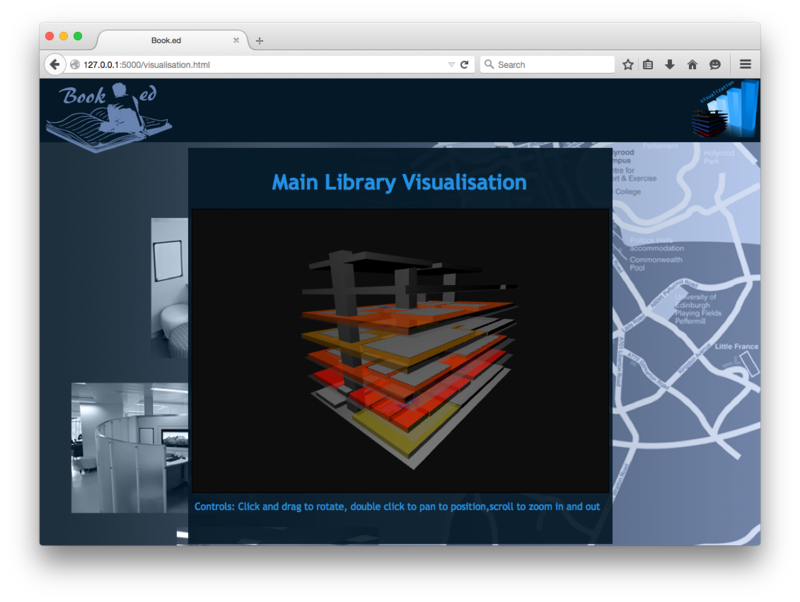 It will also provide a nice visualisation of study space availability over time. Make group travel easier and what not. Web application that helps you plan a multi-city/country trip by finding the lowest combination of plane ticket prices..
Yasen Petrov, Informatics Brief summary of skills/knowledge and what you want to learn more about this week. Lazar Lazarov, Informatics Brief summary of skills/knowledge and what you want to learn more about this week. Stiliyan Emanuilov, Informatics: Brief summary of skills/knowledge and what you want to learn more about this week. Teodor Todorov, Informatics Brief summary of skills/knowledge and what you want to learn more about this week. Elitsa Bankova, Informatics Brief summary of skills/knowledge and what you want to learn more about this week. A mini social network for neighbourhoods (Android). 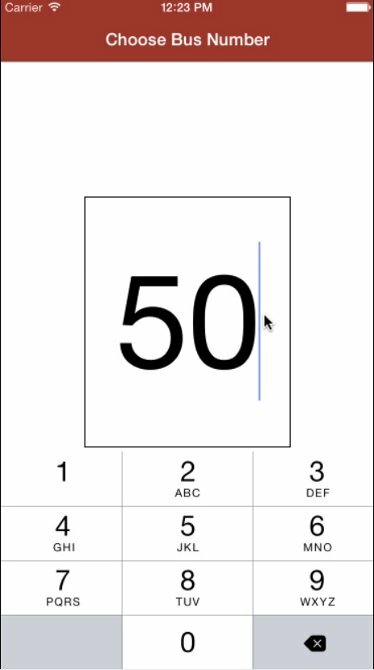 Currently, the app is able to create posts and events, to comment and tweet them. The events and posts are visible in a certain radius which is set up by the poster. 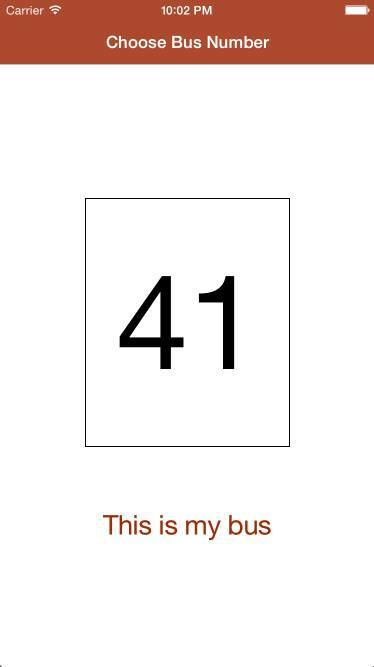 Visual representations of correlations in the stock market. WhereNow is a website and application that allows you to find interesting locations to travel to based on social media trends. WhereNow keeps you up to date with what’s happening and where it’s happening and, most importantly, helps you get there fast! Based on the idea of discovery and spontaneous travel, WhereNow is the perfect way to plan your next fun adventure! WhereNow uses a variety of data sources. We take location data generalised from Twitter where we look for areas around the world with anomalously high concentrations of tweets. Based on positive or negative sentiment from those tweets WhereNow converts this location into a trending “hotspot”. We then find the nearest airport to the event and use Simple Weather to tell you what the skies will look like when you get there, a short location descriptions is provided by Wikipedia, maps by Google, flight prices powered by Skyscanner, and photos via Panoramio. Knowledge in business economics, finance, marketing and science. Web development (HTML, CSS, JS, PHP), Java, iOS dev. I’d like to get my hands dirty into something new and fun! A web application that provides students and staff with a convenient way to integrate their university timetables into their personal calendars for an easy and fast access at any time from any device. Application parses details from student’s timetable, which is generated by the university Path portal (https://path.is.ed.ac.uk), and automatically generates CSV and ICS files, which can then be easily downloaded and imported into any Calendar appilcation. Katie Hartin, SPS Skills- experience in qualitative research in East Africa, Kiswahili oral/written language skills; I’d like to learn more about how I can incorporate data visualization into my own research and how I can expand my skill sets. Our goal was to visualize the data in a way that is informative and tells a story about various types of emerging technology trends in Nairobi. Beyond technology, it can also serve as a general platform to investigate other key development trends, such as gender or education, and even broader issues of society as well. We used data from local news media (Daily Nation), local reports (Voice of Kibera), technology blog (iHub) and Guardian website, and others can be easily incorporated.